This Pumpkin Crunch Cake recipe is a scrumptious twist on pumpkin pie, adding a little variety to your Thanksgiving dessert table. The goodness on top becomes a crunchy bottom crust. 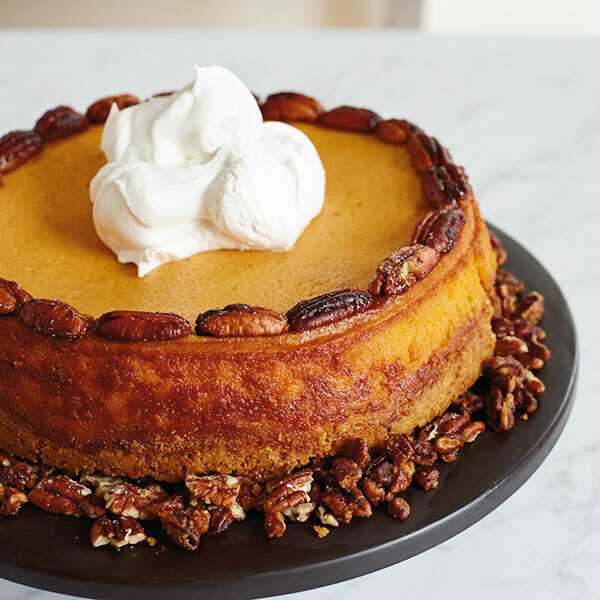 This pumpkin dessert recipe is super easy, and yet, so impressive! Don't be surprised if this becomes a Thanksgiving favorite. Grease bottom of 9-by-13-inch (or 9-in. round easy-release) pan and line with parchment paper. In a large bowl, mix together everything but the cake mix, pecans and butter. Pour into the pan, and then sprinkle the dry cake mix evenly over the pumpkin mixture. Sprinkle top with chopped pecans, and then drizzle with melted butter. Bake at 350°F for 50 to 55 minutes, or until golden brown. Cool. Loosen edges with knife. Place a platter on top of the pan, and then invert the cake so the top of the cake is now the bottom crust. Top with whipped cream.